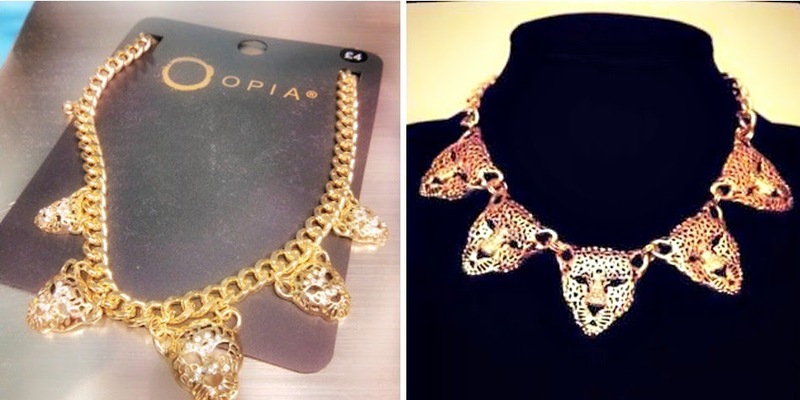 On my last trip to London, I've spotted this leopard necklace in Primark Oxford Street East (Tottenham Court Road) and wanted to get it. By the time I finally decided to go for it, I didn't have much time to go back to the store. Anyway, unlike the recent online rip-off on a new jewellery website, I had lost trust in these kind of online shops. However, I found Juste Bijoux's Savannah necklace for £7.95 and wanted to give the shop a try, as I feel the necklace is a great alternative, which looks stunning and even better than the Primark one. I placed my ordered and it came with free delivery within a few days. The delivery was super fast and the customer service team were extremely helpful. When the necklace arrived, it was wrapped nicely in a cardboard gift box and in safe bubble wrap. They've also made the effort to include the ö-Umlaut in my surname, which I really appreciated. A business card and receipt came with the package, too. The necklace had a faulty clasp, but the team sent a replacement asap. The necklace has a pleasant weight and looks very trendy. It is fashion jewellery though, so I'm well aware it might lose its colour from constant wearing over time. I brought it with me on my Easter break, wore it every day and received a lot of compliments. I've forwarded my feedback to the brand and they even featured me on their Twitter page! Will get free delivery on my next order which is an additional big plus. A leopard necklace goes with anything, if it is a white blouse for work, as a casual accessory for a dress or to catch some compliments when you're out.